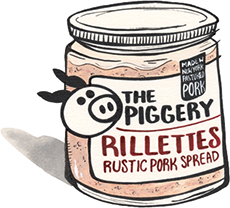 Pork Rillettes for sale. Buy online at Zingerman's Mail Order. Gourmet Gifts. Food Gifts. Think of rillettes (ree-yets) as France’s version of pulled pork. This one comes from upstate New York, not Paris, but the style is all French. It’s made by Heather and Brad Sanford. They raise heritage-breed hogs that get no antibiotics or hormones while they live their lives out on pasture. To make the rillettes, the ham hocks and hams are smoked over applewood for about a day. The meat is shredded by hand and mixed with verjus (vinegar from unripe grapes) from a local vineyard, maple syrup, mustard, and spices. Finally it’s jarred in the traditional manner—under a protective layer of lard that naturally preserves it until you're ready to eat. And you will be. The flavor is rich but bright, and supremely porky. Serve rillettes in an appetizer spread with pickles and crackers, toss some on a pizza or into a pasta dish, or warm them up and spread 'em on crusty bread with cheese or jam.